It is argued that decentralization increase efficiency in public service delivery by transferring the authority and responsibility to manage service delivery to local level of government. Nevertheless, the experience of decentralization in the world has had diverse results, including Mexico. This paper tries to argue, the role of local institutional frameworks in determining how decentralization of water utilities can lead to different water utilities performance outcomes based on the local institutional frameworks in Oaxaca and Tabasco in Mexico. 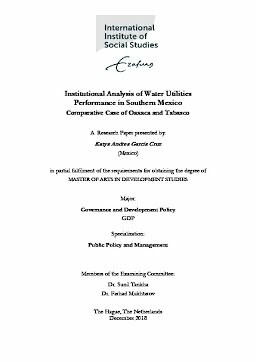 For this purpose, the paper uses the Institutional Analysis and Development (IAD) Framework to analyze and compare local institutions in which decentralized water utilities in Oaxaca and Tabasco operates to explain why they have different water utilities performance outcomes from decentralization despite having similar characteristics such as water quality and water availability per capita among others. The results find that difference in decentralized water utilities performance outcomes in Oaxaca and Tabasco arise due to different local institutional frameworks in these two states. In particular, decentralization has led to less efficient water utility performance outcomes in Oaxaca relative to Tabasco primarily because of the abundance of incentives to not comply with the cost recovery policy. Therefore, it is argued that decentralization is a blanket statement and only along with local institutions it determines the results of public service delivery.